Why Don’t Tottenham Have Any Footballing Friends? The Wealdstone Raider may have been talking about the first 40 years of Tottenham’s existence. If you’ve read our last two blogs on the true story behind Arsenal’s election to the First Division in 1919 and how the truth has subsequently been distorted, you may be wondering why Arsenal polled so many more votes than Tottenham. The reality is that the actual question should be why did Tottenham gain so few votes? Here, we try to give an idea of why. A couple of years ago Phil Wall wrote a blog which asked why no one likes Tottenham. I think Phil’s post is supposed to be light-hearted but there is a ring of truth to it. Whilst making the final read through of Woolwich Arsenal: the club that changed football to make sure we hadn’t left anything untoward in there before publication we had to check something, and whilst doing this stumbled across the events of 1908 that led to Tottenham being admitted (we won’t use elected as that would be a pretty loose term to describe what happened) into the Football League. It’s a strange set of circumstances that doesn’t seem to get mentioned in popular histories of the club and it’s not hard to see why. But before we look at 1908, let’s take a step back to 1892 to give an idea of how popular they were with their peers. When Royal Arsenal turned professional in 1891 they had a need to provide regular competitive games to keep their fans’ interest in the game. A diet of friendlies against local rivals and the big northern teams was OK but these games were prone to being one-sided affairs or there was a risk of the opponents pulling out at short notice. The Royal Arsenal committee decided to test the water and opened discussions with their neighbours about forming a Southern League. The interested parties met in February 1892 and agreed to form a league consisting of 12 teams. Those 12 teams were: Chatham, Chiswick Park, Crouch End, Ilford, Luton, Marlow, Millwall, Old St Mark’s, Reading, Royal Arsenal, Swindon and West Herts. Tottenham had also attended the meeting and expressed an interest. I’m not sure exactly how the voting was set up but Tottenham finished at the bottom of the list with only 1 vote (presumably their own). 120 years ago they were friendless. The Southern League finally got going in 1894, without Tottenham. They continued to be friendless as they did not gain enough votes to be elected in 1895. The following year they hedged their bets and applied for positions in the Southern League and the Football League. They were eventually accepted into the Southern League but only gained two votes for their Football League application, finishing behind the likes of Crewe and Fairfield. At the time the Southern League was formed of two divisions. Tottenham were elected into the First Division. I’ve not found any records of the rules of elections into the Southern League but I assume that clubs of a certain size could be elected directly into the top division. However, there was promotion and relegation between the two divisions so it seems a bit strange that they weren’t put into the Second Division. After 12 years in the Southern League Tottenham decided to try their chances with the big boys. In February 1908 Tottenham (along with QPR) resigned from the Southern League and made it known that they would apply to join the Football League. QPR were justified in their application as they were runaway winners of the Southern League. Tottenham eventually finished 7th (and this was by virtue of a goal average 0.01 better than Northampton). The Southern League was fed up with its members applying to join the Football League only to come back with their tails between their legs when they were unsuccessful and causing the Southern League administration problems such as re-arranging the fixture lists. So, at the 1908 AGM the members agreed that any team wishing to resign from the Southern League had to do so by December of the season that they wanted to resign. They also expelled Tottenham, something which came back to bite them in the backside. The Football League then held its AGM. Grimsby, Chesterfield and Lincoln City finished at the bottom of Division 2 and had to apply for re-election along with the clubs applying for election: Bradford PA, Tottenham and Burton United. Grimsby and Chesterfield were re-elected, and Bradford PA finished third in the vote and replaced Lincoln. Tottenham finished 5th in the vote (behind Lincoln). It seems that they over-estimated their popularity – Tottenham were not elected into the Football League! To make it worse (or better depending who you support) the Southern League didn’t want them back either. There was then talk of forming a Third Division of the Football League with the following clubs applying to join it: Burton United, Crewe, Croydon, Darlington, Doncaster, Huddersfield, Kettering, Lancaster, Lincoln, Rotherham, Southport Central, St Helens, Tottenham and Walsall. All they needed was St Trinian’s under-12s to make it a really competitive league. Can you imagine the stick Arsenal fans could give Tottenham fans if this had taken off? However, this all fell through. That then left Tottenham without a league to play in as they had also resigned from the Western League (a regional league for London clubs, despite its name). Towards the end of June 1908 Stoke told the Football League that they were in financial difficulties and resigned from the League. The Football League held a special meeting to find a replacement for Stoke. To confuse matters, Stoke then asked to be re-instated into the Football League. The 5 teams that applied for Stoke’s place were Stoke, Lincoln, Tottenham, Rotherham and Southport Central. Tottenham and Lincoln tied for first place so a second vote was held with just these two clubs in contention. Tottenham were very lucky here as the Management Committee could have taken the voting from the AGM as a yardstick and elected Lincoln into the League. In the second vote they tied 20 votes each. It was then left to the Management Committee to decide and they voted 5-3 in Tottenham’s favour. Arsenal showed what gentlemen they were and supported Tottenham’s application throughout the whole debacle. But that wasn’t the end of the matter. Following all of this rumours surfaced that Tottenham had offered Stoke financial inducements to resign from the Football League in the first place. Finding themselves with no League to play in they bribed another team to resign in the hope that they could take their place. Even then it took three votes to get them into the League. This wasn’t the first time that this had happened – it was alleged that Oldham had done the same the previous season, offering Burslem Port Vale £1,000 to resign which included the transfer of two players. By strange coincidence, Tottenham bought two Stoke players during the summer of 1908! Skip forward another 11 years and we have the expansion of the Football League following the resumption of football after the First World War. And here we see, once again, that Tottenham’s unpopularity with their peers cost them a place in the top flight. As to why, we don’t know but it’s about time their unpopularity is used as the reason they weren’t elected, rather than the malicious lies of Henry Norris bribing other clubs, for Arsenal being elected to the First Division. The main content of this article was written by Andy Kelly and originally published on www.blog.woolwicharsenal.co.uk. Funny, Andy, how you make statements and provide documentary evidence (I know, I’m using big words which may confuse the Spuds), while the Spuds come up with words like “drivel” and provide… nothing. Nothing except comments about “Woolwich.” Well, where would you rather have your club’s roots: At a royal arsenal in Kent, where men worked hard in the service of their country… or in the marshlands of Middlesex? @N5_1BU………..what “Hotspur family” are you talking about? Perhaps you mean the Percy family – Dukes of Northumberland – who owned much of the land around Tottenham at that time (hence Northumberland Park)? Secondly, why would the nascent football club have needed permission to use the name Hotspur? It wasn’t a trademark of the Percy family. It wasn’t owned by them. It was a nickname given by the Scots (and immortalised by Shakespeare) to a Percy family ancestor who had died some 500 years previously. What a bizarre and wholly inaccurate notion to think that permission should have been required! Oh, and, the Middlesex thing again……….yawn. It’s an argument that is only ever persisted with by tedious pedants. By the 1880’s, the area of Tottenham was part of the contiguous (and growing) urban sprawl of greater London. That’s all that really matters to anyone who doesn’t have an anally retentive point to prove. @Andy Kelly………..your amusingly obsessed and defensive article was informative. For which, thanks. However, I suspect that your ability to research old papers and documents somewhat exceeds your ability to draw worthwhile and credible conclusions from your research. It seems to me that all that time with your nose buried in a musty, old file or your face glued to a computer screen or microfiche reader (whichever your medium of choice) should have resulted in rather more than a lame Nelson Muntzesque “Haha!”….Tottenham don’t have any friends. Thanks for the reply. I’d be interested to read a view from a Tottenham perspective of the events of 1919. Preferably with some plausible supporting evidence. Funny how when the truth is told about why no-one ever had or ever will like them lot from middlesex they all start talking drivel. Or vice-versa the truth does hurt ! ! ! I note that the Spurs and Oldham rumours are not described as “malicious”. Well done on a long piece of biased drivel. The land was owned by the Percy family and the use of the Hotspur name was agreed via the family, cricket and football club. As for Middx the whole of London was in the county ie the Middlesex station in the boat race. As all your other uttererences are tripe you lose all credence. There is another point that deserves mention and that’s the name of the club. Although in that era socialism was gaining popularity in this country – a process which via detours ended in full suffrage – deference for the aristocracy was still a default position. When they were formed there was another team called London Hotspur who had permission from the Hotspur family to use the name (if I remember correctly there was some kind of charitable payback). Not only did the spuds use the name without permission (even ignoring requests to desist) but it was rumoured they even pretended to be London Hotspur to gain fixtures which didn’t make them popular to say the least. Add that to their desperation. even though they were in Middlesex until the mid 1960s, to be seen as a London club and you can see various reasons why they were so unpopular. The name came from a cricket club whose facilities where used by the founders of the football team and there were no requests to ”desist”. Every borough north of the river Thames was in Middlesex including the City of London, Westminster and the khasi of Islington, As for the quote of the ”mid sixties” Tottenham had the N17 postcode long before that, all that was added in the reorganisation were two characters onto the end of it. As with the researchers and contributors of the article it’s all erroneous, piffle to keep a few Goners happy. Having worked for many years on Fleet St I can say that most of your info can be taken with a pinch of salt. A point to be made why is Tottenham’s biggest gate almost a thousand bigger than yours, why is their European acheivments in excess of yours when you have been in Europe so long. Why did Arsenal want to move to SW London why have they not taken up the name of the area in which they play? They are a arrogant nomad club whose then owner achieved League status by devious means. I think any credibility you might have had vanished in your first eight words. It means that I can research professionally and find something near the truth, not use the pious cant from a statement of the organisation involved because it suits me. Where are the answers to the points I made, you cannot deny them as you said above, the truth hurts. The points that you raised have no relevance to the article which is why I didn’t reply. We have addressed the issues surrounding Arsenal’s move from Plumstead in our book. It is the most frank and comprehensive explanation that has ever been written. Back to this article. The main crux is that when it came to Tottenham applying to join any league it has been recorded that the continually struggled to gain support from their peers. If you can “professionally” prove otherwise I’d be more than happy to see it. Arsenal, on the other hand, have always been supported by their peers: being elected to the original, but ultimately unsuccessful, Southern League, invited to join the Football League and having the wholehearted support of the Football League and FA when the went into liquidation in 1910. How so? It’s the third part of a series of articles that tries to explain the actual events of one of the biggest myths in Arsenal’s history. Please tell me you didn’t spend long typing up this drivel because of your obsession with Tottenham? Surely this time would of been better spent on why you have two £40m footballers in your team and still nowhere near to challenging for the league and below our team made up of half the under21’s? As someone said earlier, totally classless. Maybe you should talk about the the rights and wrongs of your very own fans who have been abusing your greatest ever manager in recent weeks? Maybe you might move again as you seem to be running out of genuine supporters in North London? Do you have any comments on the historical aspect of the article? It sounds like the Southern League voting was as stuffy then as the FA are now. Jobs for the boys and blinkered, selfish teams back then too. Some things never change. Glad you are proud of that. Maybe the heading should read: Arsenal were arrogant back then too. Interesting that you deride the quality of a proposed 3rd division Tottenham wanted to play in with with Burton United, Crewe, Croydon, Darlington, Doncaster, Huddersfield, Kettering, Lancaster, Lincoln, Rotherham, Southport Central, St Helens and Walsall. While the Woolwich wanderers were playing in a league with those giants of football: Chatham, Chiswick Park, Crouch End, Ilford, Luton, Marlow, Millwall, Old St Mark’s, Reading, Swindon and West Herts. 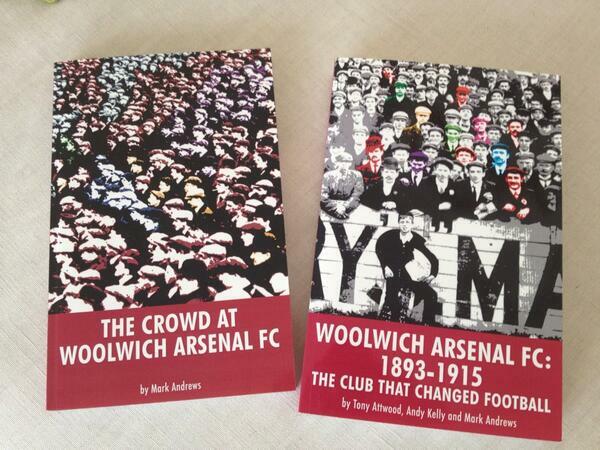 “Woolwich Arsenal FC”…. Says it all. Uh, no. Being a typically illiterate Tottenham fan, you have failed to notice that the teams cited there were meant to be in the Southern League of 1892, which never happened. Possibly because the Middlesex club wanted in and contaminated everything. Arsenal grew too big for Woolwich, and became the first club in North London, which Tottenham were not legally in until 1965. Arsenal grew too big for merely Islington, for North London, for North London, for the South of England, for England, for Britain, and even for Europe. All over the world, people beg Arsenal to come to their countries. Who asks Tottenham to come? American clubs, because they know Tottenham are one English team whose fans they can easily outnumber and outclass. Tottenham were a joke in 1892, in 1919, in 1971, especially in 2006 (lasagna, whoa), and they remain the biggest joke in European football in 2015. Countless hours of research to ‘prove’ that Spurs were friendless?? I guess this is what happens when you realise that your ‘great club’ are facing the prospect of being also-rans along with the rest of the current Premier League teams who aren’t Man Ure, Chelski and Man Citeh?? Whatever the reasons its amazing that Gooners are so concerned about it all. You apparently had so few friends that you needed to re-locate to a few miles down the road from Spurs?? Maybe the reason we had ‘no friends’ was the fact that we won the FA Cup as a non-league club in 1901, upsetting the establishment and setting a record that has never been bettered? Or maybe the fact that we were, even then, attracting serious talent to the club despite not being in the top flight?? Amen. Arsenal have always believed dubious means to get what they want. Promotion in 1919, relocation north of the river. Even the modern day, consistently being at home after CL games, when usually Chelski got the away fixture, to David Dein deciding that Spurs couldn’t have a postponement of the lasagna game, whilst standing on his home pitch. Nothing changes. utterly obsessed wth Tottenham Hotspur. You must be an embarrasment to your fellow Goons. History is interesting and it’s good to know what happened in the past. I would say though for years as a Spurs fan I was looking across to see what success Arsenal were getting. All we had was the Stand up if you hate Arsenal etc. A few years back things started to change though and despite a dip last year after the Bale sale, we have caught up. I would generally say I’m not too interested in what they do. In recent times they have been more interested in Spurs, even the players such was Walcott and the Polish keeper inciting trouble and displaying lack of class by goading fans with their actions. This article, though well written and a representation of the facts is an extension of a similar trend of winding Spurs up. When Henry and Viera were in their pomp some Arsenal fans almost pitied us. Not any more! Thanks for writing a bit more than your peers. Although we at The Arsenal History do have a healthy interest in contemporary affairs of Arsenal, this site is primarily based on the club’s history. The reason for its existence is to bring to the fore the vast amount of mis-told stories from the club’s past. That is all we have done here. We have no issue with dredging up the club’s less salubrious episodes as well. In fact, we have written extensively in both our books about the Manor Ground being closed due to a referee being attacked. We leave all the baiting about the current plight of the team to other sites that just want easy hits. Sounds like you want to be friend. Totally and utterly obsessed with spurs. what an utterly pointless piece of drivel.